Editorial coverage: Cover Look (p. 44) mentions the Ashley twins' upcoming fragrances, Nirvana White and Nirvana Black. More talk on Nirvana in the full length feature Doubling Down (p. 198). The Beauty Reporter section includes Chanel No. 5 Intense Bath Oil in the Editor’s Favorites (p. 54), a paragraph on "4 Ways to Wear Fragrance" (p. 60) and a “Smell This” feature in which three experts talk about Express Glam (they hate it! just kidding, p. 60). Beauty 101 this month is on Uncommon Scents, and includes Best Men's Scents for Women, Best Women's Scents for Men and Best Unisex Scents. 10 Beautiful Things selected by Tory Burch includes her own debut fragrance (p. 82). Presents Moment includes a number of fragrance gift suggestions, including the Nest fragrances and Fornasetti incense (p. 86). Insider's Guide includes a short interview with Anjelica Huston, who talks about her favorite fragrance, Jean Patou 1000 (p. 114). War of the Roses (p. 182) is about modern rose fragrances, and includes quotes from Victoria Frolova of Bois de Jasmin, Mandy Aftel and Alyssa Harad, among others. Editorial coverage: Nothing, not even in a Christmas issue! Note: As always, thanks to Kevin — I read Allure, he read all the rest! 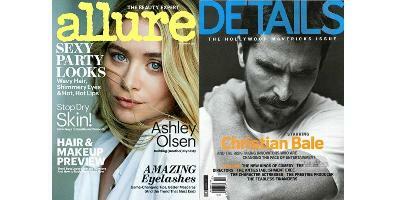 Maybe that very serious and “tortured” looking Christian Bale is supposed to be “Christlike” for Detail’s Christmass issue. Actually, he just kind of looks like a movie star whose assistant has told him that the Starbucks Latte steamer is broken and he’ll have to drink his Nigerian blend with normal skim milk. Looks like the poor thing has a backache to me. Robin, I think it’d be a nice touch if you modified your website so we could print out copies of the scent strips from the magazines. You’d be sorry. Allure is so stinky I have to keep it in a plastic bag. I’d settle for a screen version of scratch and sniff. See a photo of a scent you want to sample? Scratch that photo of the bottle on the screen and enjoy. Robin, get on that will you? Hey, it’s on my list of NST improvements, no worries! That works; why waste all that scented printing ink? Hey…. but there’s an idea… if you ganged together enough printer nozzels, and hooked each one to a different note…. I don’t read Allure, so I don’t know what’s normal, but that sounds like an insane amount of scent strips to me. You are wise to keep it bagged! It’s just because it’s December, it’s not usually that many! But I’m not a fan of scent strips anyway, they always smell bad to me, even when they’re for fragrances I like.